The Steelers returned to their WINNING ways in front of their fans at Heinz Field today! Defensive line: It was the best defensive effort of the season, considering the opposing offense, and was a classic example of how pressure and coverage work hand-in-hand. Cam Heyward had 1½ of the six sacks on Matt Ryan and the Falcons averaged just 3.3 yards rushing despite a 20-yard run by Devonta Freeman. The plan was to exploit the interior of the Falcons offensive line and it worked. Grade: B+ (via Gerry Dulac, Pittsburgh Post Gazette). Did we mention that Julio Jones, the NFL’s receiving yardage leader, did not have a catch until the fourth quarter and his longest gain was 18 yards. (also from Dulac). “We had a great week of practice and we communicated a lot better todayWe got more pressure today but I also think that our back end played really well, too. They went against some top receivers, [Mohamed] Sanu, Julio [Jones] and I know Sanu got the one touchdown but I liked the way our secondary played. We didn’t blitz necessarily more, but we blitzed some. We won a lot more of our individual battles up front and sometimes the false pressures and mixing it up created confusion for them. I just thought we played really well.” (From Paul Zeise, Pittsburgh Post Gazette). The Steelers defense was supposed to get lit up by Matty Ice and the high-powered Atlanta Falcons offense. This was supposed to be another game where an opposing offense came into Heinz Field and moved the ball at will. The Chiefs did it to the Steelers. The Ravens — who finished a game Sunday with only 9 points — did it to the Steelers. The Falcons, with Matt Ryan, two big-time receivers and an excellent running back, would surely do it. Right? Well, not quite. In fact, not at all. 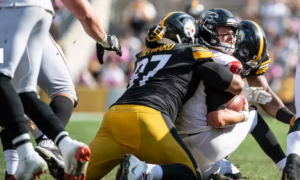 The Steelers defense put their foot down and said enough is enough and that was the story of this 41-17 blowout of the Falcons. It wasn’t about what the Steelers offense did — the Falcons defense is injured and awful — Sunday was about the defense. 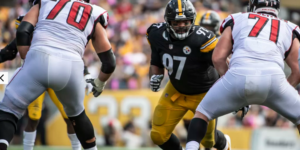 The performance was made even better, or at least more entertaining, by the face that the Steelers defense did it in throwback fashion with a ferocious pass rush. The official stats say the Steelers had six sacks and that is probably correct, but boy, it sure felt like a lot more. Heck, even if they only did sack Ryan six times they got to him seemingly every time he dropped back to pass. They hit him so many times and knocked him around so much that the Falcons coaching staff replaced him with backup Matt Schaub for their final drive, no doubt in order to preserve his physical well being. It was like watching those old “Blitzburgh” Steelers teams that salivated when they got teams into passing downs and gave quarterbacks nightmares pretty much every week. Congrats to James Connor, who was named Steelers Digest Player of The Week!